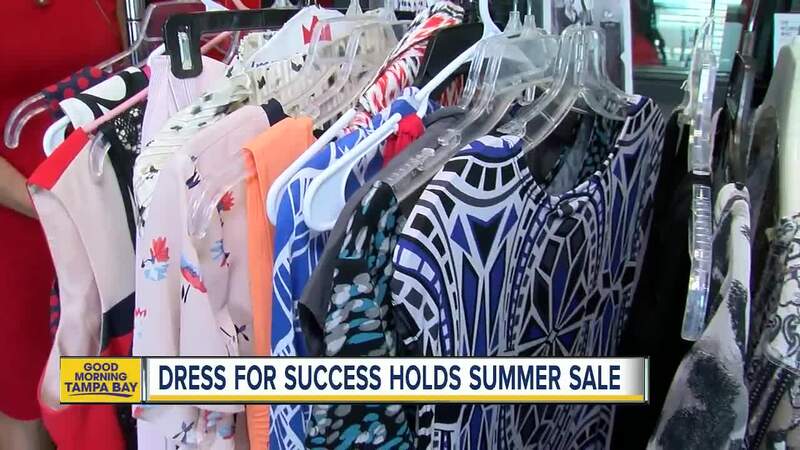 A Tampa Bay non-profit organization is holding its annual inventory reduction sale giving you a great chance to expand your professional wardrobe without spending a lot of money. The Dress for Success sale begins on Friday. You will be able to find suits for $10 and clothes for $5. The non-profit, which only employs four people, relies on grants, donations and fundraising to keep their doors open and help get women into the workforce by providing designer outfits at low prices. Benefits of the sale will go right back into the organization's clothing options. "The proceeds for the sale go towards the larger women sizes," says Katie McGill, Executive Director for Dress for Success. "That's what we really have a challenge with people donating. So, we take the profits to go shopping for larger size shoes and clothing and that really helps us." The non-profit organization is celebrating its 20th anniversary in the Tampa Bay area this year. The sale will be at Bayshore Baptist Church in Tampa. Friday, July 20: 9:00 a.m. - 7:00 p.m.
Saturday, July 21: 9:00 a.m. - 3:00 p.m.
To learn more about Dress for Success, click here .